Salut, and welcome to our lesson about French pronouns at Language Easy! It’s important to have a good understanding of what pronouns are, so make sure to be attentive during this lesson. However you don’t have to worry, it’s not that complicated! What are French pronouns ? Qu’est-ce que les pronoms ? Pronouns (les pronoms) are all the words that replace a noun (or a nominal group) in a sentence when we don’t want to refer to it directly. In this sense, what is referred to by the pronoun is called its referent (référent). Substitute pronouns (pronoms substituts), or representative pronouns (pronoms représentants), take the place of another element already present in the text, in order to avoid a repetition. In this case, this other element is called the antecedant (antécédent) of the pronoun. Jean est jeune, il a vingt ans. Jean is young, he’s 20. Pourant, c’est un garçon matûre qui a déjà fait beaucoup de choses. However, he’s a mature boy who already achieved a lot. Some French pronouns don’t have an antecedant and are indicators of the enunciation (indicateurs de l’énonciation) as they refer to the context of the speech only, for example : who is talking, to whom, about whom, for whom, etc. En fait, je serais heureux de te présenter à lui. Actually, I‘d be happy to introduce you to him. Finally, nominal pronouns (les pronoms nominaux) are the French pronouns that don’t have a referent, they behave exactly as nouns. Generally, French pronouns don’t have a proper gender or number, they inherit from their referent. However, when the referent doesn’t exist (in the case of the nominal pronouns) or if it has an indefinite gender, then the pronoun takes his masculine form. You are also an attractive man. 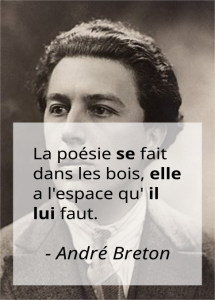 Linguists argue a lot about whether these form of French pronouns is actually masculine, or a grammatical neutral that has the same form as the masculine. They seem to agree that the specific demonstrative pronouns ce, ceci, cela and ça are definitely grammatically neutral though. As of the purpose of not making grammatical mistakes, you can safely ignore this consideration and think in terms of masculine. There exist only a defined number of French pronouns, which we will list and categorize here. The personal pronouns (les pronoms personnels) simply replace their referent and take its grammatical person. They have various forms according to their grammatical role in the sentence. me, moi, te, toi, se, soi, le, lui, la, nous, vous, leur, les, eux. For him, it’s every man for himself. If you want to go further into the subject, read our complete article about personal pronouns. Adverbial pronouns (pronoms adverbiaux) are actually personal pronouns, but they get this name because they can also replace an adverb or an adverbial locution, in particular when they express a geographical idea. There are only two such pronouns in French, and they are invariable. The pronoun en replaces places or elements of a sentence that are introduced by the preposition de or by a partitive indefinite article (du, de la, des). Note that the partitive indefinite articles are actually contracted form of a definite article with the preposition de : du = de le, etc. Tu te souviens de ton enfance ? → Tu t’en souviens ? Do you remember your childhood / it? Nicolas vient de Paris→ Il en vient. Nicolas comes from Paris / there. I eat some bread / some. I bit my tongue while talking. I’m thinking about your sister / about her. Nicolas vit à Paris, en France → Il y vit. Nicolas lives in Paris, in France / there. Monte dans la voiture ! → Montes-y! Get in the car / in it ! I’m talking to your sister / to her. The pronoun y replaces any element introduced by the preposition à (except indirect object complements) or by a spatial preposition (à, en, dans, sur, devant, derrière, vers…). Possessive pronouns (pronoms possessifs) replace nouns that are preceded by a possessive adjective. As such, they agree in gender and in number with their referent. The choice and agreement of a possessive pronoun in French is quite different with the English. In English, the pronoun varies in accordance to the gender of the owner, and the number of objects possessed ; but in French, the pronoun vary according to both the gender and the number of the object. it’s his or it’s hers, depending on the context, but in any case it’s a feminine object. it’s his, or it’s hers, depending on the context, but in any case it’s a masculine object. It is quite a difficult thing to apprehend for who speaks a language where objects have no gender in the first place, isn’t it ? See also our complete article about possessive pronouns for more details. Demonstrative pronouns (les pronoms démonstratifs) replace nouns that are preceded by a demonstrative adjective. In other words, the use of a demonstrative pronoun instead of a personal pronoun denotes an intention of referring to an object not by a previous reference, but by pointing at it (possibly by a physical gesture) or describing one of its characteristics. Ils regardent ce tableau → Ils regardent celui-ci. They are looking at this painting / this one. Avant, ils regardaient celui qui est au mur. Before, they were looking at the one on the wall. Read our complete article about demonstrative pronouns to take a closer look at the subject. Indefinite pronouns (les pronoms indéfinis) usually replace nouns introduced by an indefinite adjective. In that sense, they are used to describe the referent in a vague way. L’un est très gentil envers l’autre. One is very kind towards the other. Beaucoup de gens sont riches. A lot of people are rich. Et bien sûr, peu n’aimeraient pas l’être. And obviously, only few wouldn’t like to be. Interrogative pronouns (les pronoms interrogatifs) replace the entity about which a question is made in the interrogative sentence. Un homme est ici. → Qui est ici ? A man is here. Who is here ? Il fait des crêpes. → Que fait-il ? / Il fait quoi ? He’s making pancakes. What is he doing ? La première est la meilleure. → Laquelle est la meilleure ? The first is the best one. Which one is the best ? 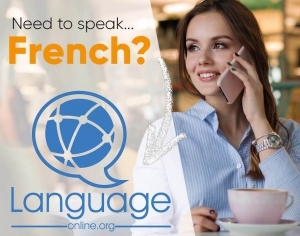 These French pronouns are not the only words used to ask a question, instead we also use interrogation adverbs (adverbes d’interrogation) : combien, comment, pourquoi, quand, and où. Unlike the pronouns, their role is to formulate a question without referring to a nominal entity. Relative pronouns (les pronoms relatifs) introduce a proposition that serve as a complement to a noun. Marc a un chien. Le chien est gentil avec moi.→ Marc a un chien qui est gentil avec moi. Marc has a dog who is nice to me. L’endroit où je vais est très joli. The place where I’m going is very nice. Par chance, je connais l’endroit duquel tu parles. By chance, I know the place you are talking about. You’ll probably need a little more than examples to fully understand them, so check out our dedicated lesson on relative pronouns. Numeral pronouns (les pronoms numéraux) replace a noun preceded by a numeral adjective (un adjectif numeral, e.g. a number). Cardinal numeral pronouns (les pronoms numéraux cardinaux) are the same as numbers, they indicate a quantity and they are invariable. Ordinal numeral pronouns (les pronoms numéraux ordinaux) are derived from numbers and indicate an order (the first one, the second, etc…). They must agree in gender and number with the referent. Marc a trois chats : un est blanc, deux sont noirs. Marc has three cats : one is white, two are black. Le premier est aussi une très bonne chasseresse. The first one is also a very good hunter. The notion of You and Me seem absolutely natural and universal to us. As a matter of fact, all languages on earth seem to include the notion of pronouns. But is it absolutely true ? Studying the Pirahã language, spoken by a small population of 150 persons in the Brazilian Amazon, might open our perspective. In this sense, there is a theory that all their pronouns were actually borrowed from other languages. This is a complex matter of course, due to the little number of people studying it, however this language seems to be very different in other ways, so why not ? For example, they don’t have words for the colours (everyone is free to express any color by evoking anything that actually exists with that color), they don’t count and don’t even have a word for “one”, and their culture (and language, by extension) don’t allow them to express things that they don’t have the direct experience of. They also seem to lack of a collective memory older than two generations. After your study of French pronouns, learn a bit about this fascinating language here if you’re interested. Et voilà, we reached the end of our general lesson about French pronouns. Take a rest, my friend, take a rest, before you deepen your study of all the different types of pronouns in the next lessons, starting with the French personal pronouns.